Portions of an intricate Roman mosaic depicting two birds perched on a vessel have been discovered in the Swiss municipality of Avenches, in the canton of Vaud. Uncovered recently during routine water pipe maintenance, the mosaic features a square with sides measuring around 1.55 meters (approximately 5 feet). According to archaeologists, the newly-found mosaic contains exquisite decorations and a distinct border of small yellow stones. At the center of the square is a medallion, showcasing a container with two birds perched on it. The discovery was made by workers digging a trench nearly 500 meters (1640 feet) long, as part of the maintenance. Apart from the mosaic, they also uncovered the remains of several houses and graves. As per the authorities, the mosaic was part of a building that once stood on the outskirts of the archaeological site in Avenches. The Roman mosaic is currently being cleaned, following which it will be transferred to the collections of the Roman Museum of Avenches, the researchers announced. Located in the district of Broye-Vully, Avenches is a municipality in Switzerland with a history that goes back to the Celts. Archaeological records indicate that a tribe of Helvetians had originally settled on the hills of Bois de Châte, south of what later became the Roman settlement. In fact, the canal of La Broye in the region is believed to have been established by Romans. Interestingly, the Roman settlement of Aventicum, which eventually became the capital of the province, came into existence circa 15-13 B.C. Named after the Helvetian spring goddess Aventia, the town – with a population of over 20,000 people – evolved into an important commercial center during the rule of emperor Vespasian. In circa 72 AD, Aventicum acquired the status of colonia. The town wall, according to historians, was more than 5.6 km (3.5 miles) long. Recent archaeological surveys in the area have revealed the ruins of an amphitheater, a theater as well as an enormous temple complex. In 280 AD, the Alemanni – a confederation of Germanic tribes on the Upper Rhine River – ransacked the city. Later, following the collapse of Rome in the 5th century AD, the region came under the control of Germanic tribes and was eventually abandoned by the 7th century. As per researchers, Switzerland holds a treasure trove of Roman artifacts. For instance, in November 2016, archaeologists stumbled upon an earthenware pot of Roman origin filled with oil lamps and bronze coins in the commune of Windisch, located in the northern Swiss canton of Aargau. Discovered during an archaeological examination prior to the commencement of a commercial construction project, the pot and its contents are probably around 2,000-years old. Interestingly, this date corresponds with the period of the Roman Vindonissa military camp, which was located near modern-day Windisch. With regard to Roman mosaics, archaeologists have – over the years – uncovered several pieces across different parts of Europe and elsewhere. 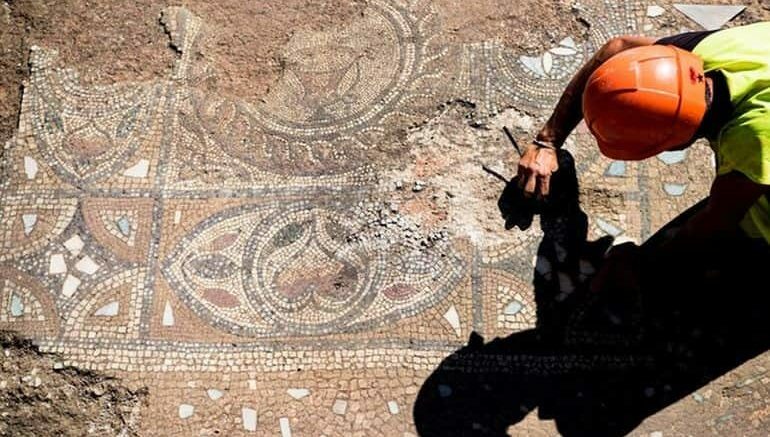 In February of this year, a collaborative effort from Israel Antiquities Authority and the Caesarea Development Corporation revealed a rare, multicolored Roman mosaic with Greek inscriptions. The excavation was carried out inside the perimeters of the Caesarea National Park that encompasses the ruins of the ancient Judeo-Roman port town of Caesarea (or Kesariya) in north-central Israel. According to the team involved in the project – which originally focused on the reconstruction of the impressive Crusaders-era entrance bridge to the town, the fascinating mosaic dates back to circa 2nd-3rd century AD and was found underneath the remnants of a larger building. Prior to that, in 2017, researchers in Britain came across a 1,600-year old mosaic from a period between 360-380 AD at Boxford, England. Depicting mythological figures along with a complementing inscription, the mosaic is thought to have part of a relatively medium-sized Roman villa of 100-ft width. The artwork on the Roman mosaic comprises various episodes from Greek mythology, including one that depicts a king named Iobates receiving the famed Bellerophon into his court. Another segment portrays the famous mythic narrative where the hero Bellerophon slays the Chimera, a fire-breathing hybrid monster that was part-lion, part-goat, and part-serpent, among other things. With a master's degree in English Literature and several years of writing experience under her belt, Sukanya specializes in creating content particularly related to history, science, and technology. In the past, she worked as a business journalist at a reputable digital media company. Apart from being an avid fan of Victorian literature, she can found spending her free time baking and exploring the Great Himalayas!